As part of the company’s commitment to application of science and global resources to improve health and well-being at every stage of life, Pfizer Consumer Healthcare has launched two new ranges of multivitamins and minerals. The official products unveiling took place during the opening ceremony of the 88th Pharmaceutical Society of Nigeria’s (PSN) annual conference which ended weekend at the International Conference Centre, Abuja. While addressing journalists, Sue Cartwright, Pfizer’s marketing manager (Southern & West Africa) explained that Centrum range of multivitamins is scientifically formulated to help fill nutritional gaps in diets, enhance multiple health benefits to help unlock energy, strengthen immunity as well as support healthy eyes and brain development. She further highlighted that the products are tailored to different ages and lifestyle; children, women, men, pregnant women and adults over 50 years. Keeping in mind that dietary supplements are not intended to diagnose, cure or prevent any disease but rather help consumers attain the recommended dietary allowance. “Although we are treating our entry as a launch, Centrum is already available in the country via informal means (suitcase trade, temporary import permits). We have been in the market since 1968 and over these years, a lot of science and technology have gone into it. 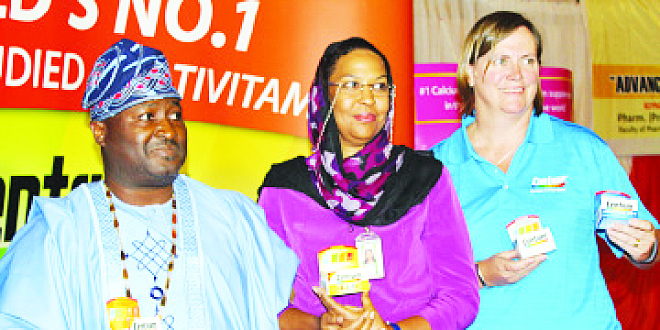 “Centrum is the most clinically studied multivitamin brand with over 100,000 patient years of exposure in clinical studies in the world,” she said, adding, both Centrum and Caltrate are approved by NAFDAC. 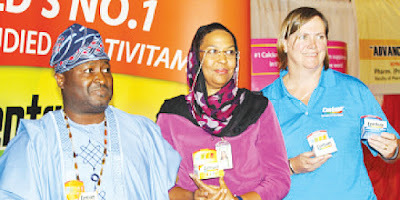 Pharm Olumide Akintayo, immediate past President of Pharmaceutical Society of Nigeria (PSN); Rukayat Odekunle, Head of Procurement, Ministry of Health (Representing the permanent secretary) and Sue Cartwright, Marketing Manager, South Africa, Pfizer Consumer Healthcare, during the product launch of centrum and caltrate products in Nigeria, by Pfizer Consumer Healthcare at the PSN National conference Abuja, weekend. During a presentation on the second product, Caltrate, Cartwright said that it is equally a scientifically formulated calcium supplement for adults and the elderly to support calcium and vitamin D deficiencies as well as assists in osteoporosis treatment. “It is the World’s No.1 selling calcium supplement with vitamin D for calcium absorption, helping to support strong and healthy bones. On her assessment of the Nigerian pharmaceutical market, the Pfizer marketing manager declared that it seems like a complex one because of the huge presence of drugs. “But I think it is very exciting. There are a lot of variants coming in. Secondly I must admit that working with Nigerian pharmacists too is quite exciting. However we are positive about the huge opportunities awaiting us,” she noted. On measures taken to avert counterfeiting of Centrum and Caltrate, Cartwright announced that both Pfizer and WWCVL teams are working closely with NAFDAC on the possibility of introducing the Mobile Authentication Service (MAS) technology. She was also quick to point out that since the products are imported into the country directly from abroad, there is no reported case of counterfeit yet. “However we have got people on the ground to assess the problem better. We (Pfizer team and WWCVL management) will be working together with Nigerian healthcare workers – doctors, pharmacists, nurses and we will be going directly to the consumers through newspapers, radio, television and digital media,” she concluded. In a related development, Zikhona Spelman, a qualified South African dietician also addressed pharmacists on the role of nutritional supplements in the new millennium. “It is pertinent to note that people are not eating the way they are supposed to. Besides, the nutritional value of food has changed over time. This is where nutritional value comes in. However such supplements are not meant to replace your normal meal,” she stressed. The dietician further harped on the need for multivitamins, specifically the ones with B Complex, to be taken in the morning. According to her, they are meant to extract energy from food. In attendance at the official launch were Pharm. Uloaka Atueyi, brand manager (Nigeria); Deepak Kanwar, WWCVL sales manager; Pharm. Bruno Nwankwo, chairman, Pharmacists Council of Nigeria (PCN); Mazi Sam Ohuabunwa, former Neimeth Pharmaceuticals Plc CEO; Pharm. Ade Popoola, chairman, PSN Board of Fellows, Pharm. Lere Baale, director of Business School of Netherlands, among others. This story was published in Newswatch Times on November 19, 2015.